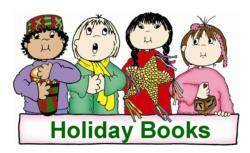 Each holiday presents a wonderful opportunity to read to your child entertaining stories and provide information about why we observe the different days. It's fun and informative at the same time! There are thousands of fabulous books to read available for your family...this is only the tip of the iceberg! Visit your local library today for more great titles!